Operation Song™ is a 501(c)(3) non-profit . All donations are tax deductible to the full extent of the law. Currently, we are only accepting electronic payments through PayPal. Helping veterans tell their stories through the process of songwriting at retreats and weekly songwriting programs. Your donations will maximize the use of resources to maintain and support the continued growth of Operation Song and the production of CDs to be distributed nationwide to facilitate the healing of veterans and their families. Operation Song has no paid staff. 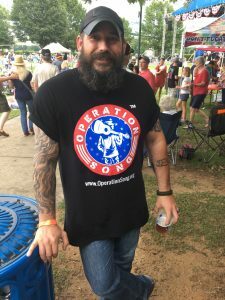 Operation Song T-shirts are a suggested donation of $25.00 each, which includes shipping and handling. Please make sure you include your size, S,M,L, XL, 2XL, 3XL and don’t forget your mailing address. For CD’s, Operation Song Volumes II and III are available for a suggested donation of $12.00 which includes shipping and handling. Again, make sure to let us know which CD and include you mailing address. The We’ve Got Your Six CD is available on iTunes. After you submit the donation you will be taken to a Thank You page. Please fill out the form with all the information requested and we will send the item as quickly as we can. All proceeds go right back into Operation Song programming.